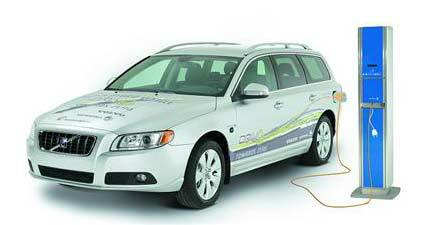 Volvo Cars and Vattenfall, the largest energy provider in Sweden, are launching an industrial joint joint venture to introduce plug-in hybrids by 2012. Volvo Cars and Vattenfall, the largest energy provider in Sweden, are launching an industrial joint venture to introduce plug-in hybrids by 2012. Three Volvo V70 Diesel Plug-in Hybrids hit the roads for testing already this summer. Vattenfall is to develop and test different high speed charging systems, for private homes as well as charging facilities in public places. Vattenfall also plans to offer customers an agreement for renewable electricity sourced specifically from wind power or hydropower. The Swedish power industry, vehicle industry, universities and governmental agencies have a vision of 600 000 Plug-in hybrids and Electric Vehicles in Sweden in 2020. If we scale that up to the Nordic level we are looking at 1,3 million PHEV’s and EV’s in the five Nordic countries by the year 2020. But Volvo Cars are far from being alone in this game in Sweden. The bus and truck maker Scania is now starting full-scale operational trials with six ethanol-fuelled hybrid buses in Stockholm. The use of ethanol will reduce net carbon dioxide emissions by up to 90 percent compared to diesel busses and the hybrid technology reduces the fuel consumption by 25 percent. According to Scania, the six buses are driven by an electrical motor that doubles as a generator when braking. Energy is stored in supercapacitors with considerably longer service life than today’s batteries. Volvo V70 is a good looking car that I see in the image. I’d like to buy one for me. How much price it? Thanks. Volvo really made sure that this car will be an above average car. With good parts like the engine, brakes and Compressors this car will make a huge impact on the market.